of its Fiftieth Anniversary with a special address by poet John B. Lee on the theme of ROOTS. 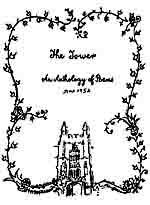 The Tower Poetry Society's beginnings were much like the planting of a magnificent flower. And that flower is still blooming, as year by year, meeting by meeting many new members add their thoughts and ideas to the Society's simple mandate to publish and promote poetry. Ida Sutherland Groom is arguably the founder of the Society, although she almost certainly had no inkling that many decades later her initial seed idea of pooling poems and finances to publish a small Gestetner produced pamphlet would blossom into the businesslike Society it has become today. Miss Groom arrived in Canada with her brother, Dr. Bernard Groom in 1950, when he took up a position as professor in the Department of English at McMaster University in Hamilton, Ontario. They came from Bristol, England after spending time during the Second World War in Montevideo, Uruguay. It must have seemed quite a relief for her as an established poet to return to an English-speaking world, although Canada then was still a rough and tumble country in many ways. Sometime during the autumn of 1951, Miss Groom made a brief announcement at a Faculty Wives Club Meeting at the university asking that anyone who was interested in writing poetry get in touch with her. A group of individuals gathered, mainly university professors and their wives, and several animated meetings followed. 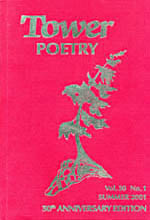 A year later, in November of 1952, the first collection of poetry known as The Tower appeared in colourless black and white, selling for fifty cents a copy. It was an immediate campus success. If Ida Sutherland Groom is the founder of The Tower magazine, Dr. Lorne Pierce (then editor of Ryerson Press in Toronto) quickly became the first of the magazine's many patrons upon receiving a complimentary copy of the first rudimentary issue. He and Miss Groom began an ongoing correspondence regarding The Tower, which lasted ten years until his death in 1962. It was largely due to his advice, encouragement, and financial contributions that The Tower received the foundation which has allowed it to survive into the twenty-first century. Ida Sutherland Groom departed Hamilton with her brother in 1960 to a happy retirement in their native England near Bristol. However she continued correspondence with the Society she founded, and had several more poems published in The Tower before her death in 1983. 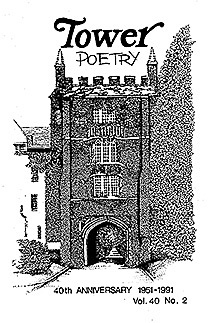 It was not until the mid-1970's that the Tower Poetry Society evolved into an organization something like it is today, with a core group of thirty-plus members who meet monthly to workshop poetry, and who publish Tower Poetry twice a year (Summer and Winter issues), containing works by poets from around the world. On February 11, 2001, TPS began celebrating its Fiftieth Anniversary with a special address by poet John B. Lee on the theme of ROOTS. Other anniversary celebrations included a dinner at which Honourary Patron and CBC Radio One host Shelagh Rogers inspired the audience with observations on the vigour and vitality of poetry in Canada, and guest speaker Dr. John Ferns reflected on the nature of poetry in the 21st Century. A special expanded 50th Anniversary edition of Tower Poetry received hundreds of submissions on the themes of "Roots," "Timelessness" and "Celebrations" and remains a lasting tribute to our founder's inspiration.